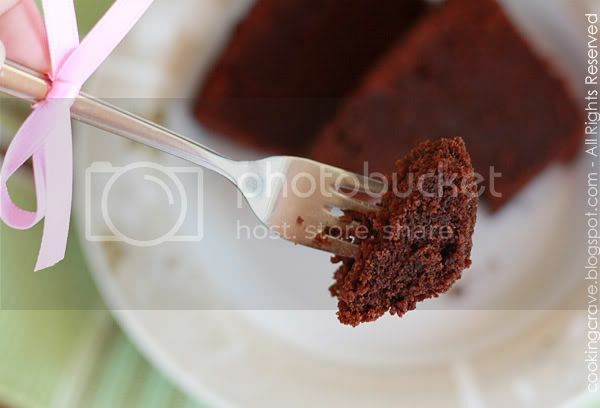 Cooking Crave™: Moist Chocolate Cake, Anyone??? This is the best chocolate cake I've ever tried. I baked the Steamed Moist Chocolate Cake not too long ago and was wondering how is this oven baked Moist Chocolate Cake turn out, will it be nice?? Anyway, I stumbled upon this wonderful recipe at My Kitchen (original recipe is from kak izan on MyR) This recipe is definitely a keeper. Try it and you will know why I'm saying so...hehe!! I LOVE everything that is related with chocolate. So, I decided to give this recipe a TRY!! 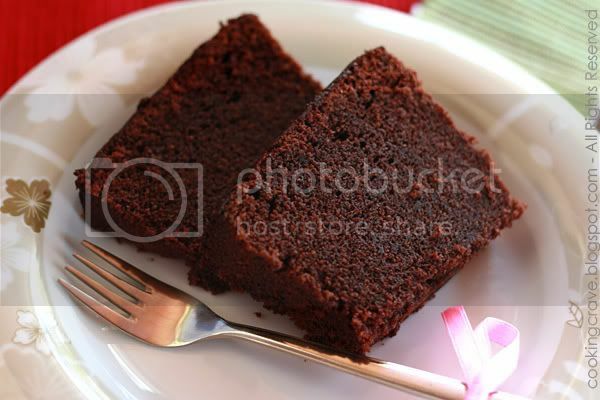 Ya, this cake turn out almost perfect, moist and rich in chocolatey taste. It's worth a try if you are one of the chocolate craze out there. 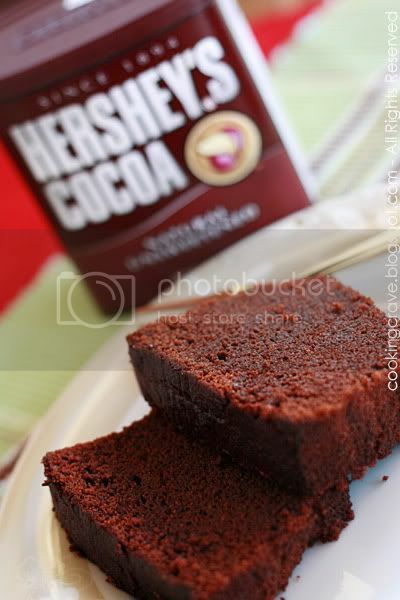 I use Hershey's natural unsweetened cocoa powder to bake this cake. This is one of my favourite brand for cocoa powder. However, I still found the cake are a bit on the sweet side. I will reduce the amount of sugar use on my next bake. My kids enjoying eating it so much, they just love it! Grease and line bottom of cake pan with baking paper and preheat the oven to 180c. Combined all ingredients for chocolate paste except MILK in a mixing bowl. Hand whisk mixture till sugar are fully dissolved. Add in milk, stir to mix well. Set aside. Sift cake flour and baking powder together for later use. In another bowl, cream butter and sugar till it is light and fluffy. Add vanilla essense and continue with eggs one at a time. Beat till well combined. Gently fold in flour mixture, alternate with the chocolate paste. *Start with flour and end with flour. Pour batter into cake pan and bake for 45-50 minutes or till it is cooked. Leave it to cool before unmould the cake. One of the BEST chocolate cake EVER!! Hi! Very nice pictures there. May I know what lightings you use?? Tracie: I took the pictures under natural light. However, I wish to get a table lamp for better lighting when I snapped the pictures at night. this is my husband's favorite, I want to bake for him, looking forward your recipe. Thanks in advance. Yes please! :) Love the look of that crumb! 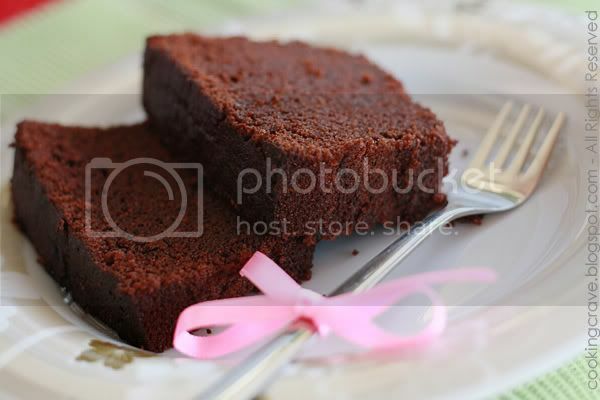 Nice moist chocolate cake and nice picture too! 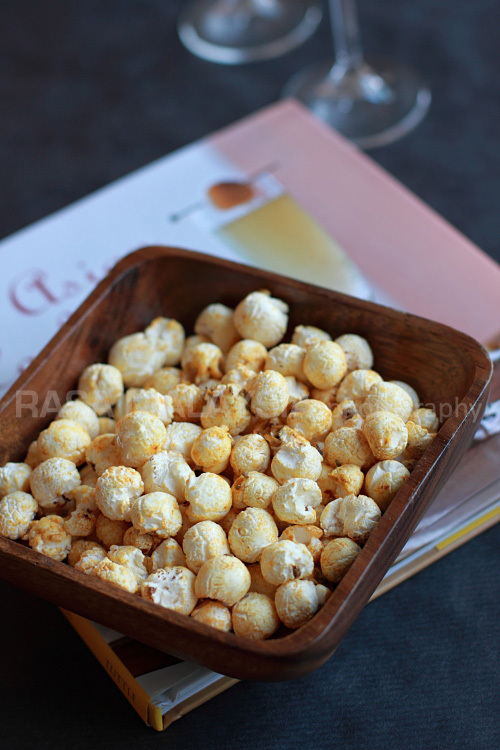 Thanks for sharing this lovely recipe, gonna to try soon. 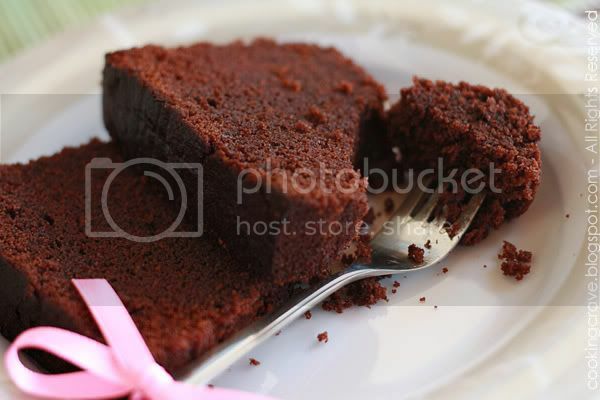 Tat cake looks nice and dark and moist and chocolaty and good! Tintin, where can I get Hershey's natural unsweetened cocoa powder ?Thanks. yum! dark, moist, chocolatey and beautiful! U got a lovely blog Amy!! Am gonna come back and definitely try ur recipes, will let u know how it turned out!! Amy, how much is 1 cup of cake flour .. 125gram ? I didn't really measure how much is 1 cup of cake flour. I use the cup we normally use for measuring baking ingredients to measure the ingredients for this recipe .. I will measure it next time if I bake this again and update it here ok? excellent recipe. We made this 3 times already and the last round for my friends. They all like it!